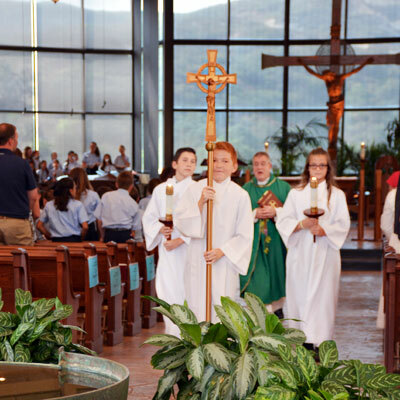 A Beloved Private Catholic School Nestled In Carmel Valley. Welcoming All — Building Foundations For A Lifetime Of Fulfillment. 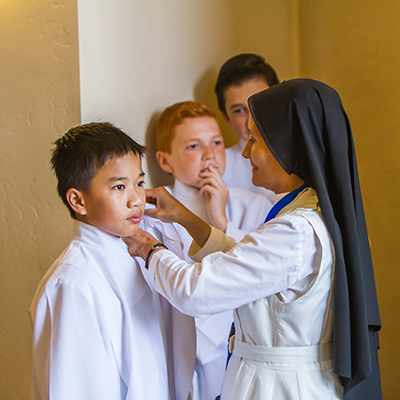 In September 1988, the Order of Union-Chrétienne de Saint Chaumond sent a small group of Sisters from France to California; with the mission of opening a school in America. Although these Sisters taught in France, they needed time to comprehend the Californian Education system – as well as the vastly contrasting culture. Over the following fifteen years, teaching high school in Southern California, the Sisters were afforded the opportunity to become experts in both! During this time, the Sisters spent years looking and praying for the perfect school site. When finally, in March 2003, their prayers were answered. 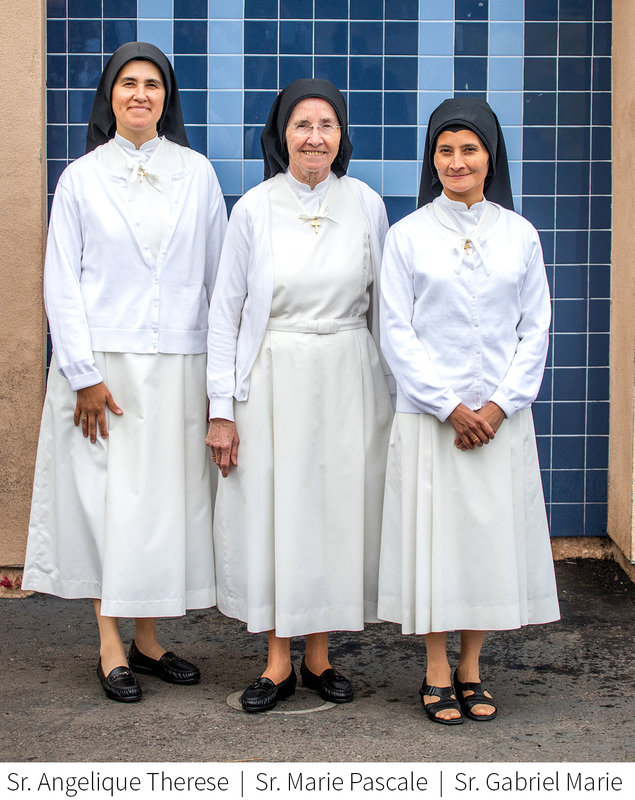 Sister Agnes Clisson and Sister Anne Perrin traveled to San Diego to meet with the Pastor of St. Therese of Carmel, Father Nicholas Dempsey, about opening a private Catholic school on the grounds of St. Therese of Carmel Parish. Father Nick had been hoping to add a school to the Parish so he was thrilled with the Sisters’ proposal. Two years later, in the Fall of 2005, Notre Dame Academy was opened. The school commenced at its temporary location at University of San Diego High School for grades K-8 while construction was completed on the St. Therese grounds. There were 82 students enrolled. In January of 2006, Sr. Marie Pascale (NDA's current Principal/President), joined Sister Gabriel Marie and Sister Marie Carmen, as the school opened at its current and permanent location. 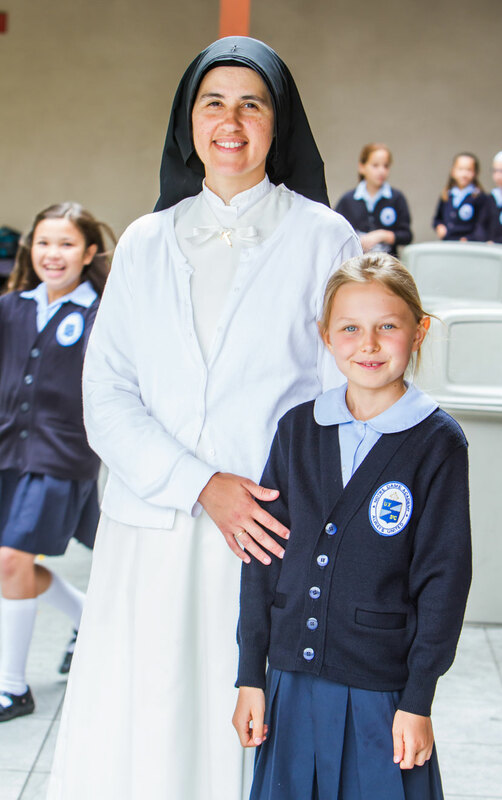 In 2016 Sister Angelique Therese joined NDA to help instruct the 300 plus students attending the Academy, from Preschool through 8th grade. Every year we proudly graduate approximately 50 8th grade students, who attend their top choice of high school. Led by the Sisters, Notre Dame Academy continually provides its’ students with the necessary foundation to build a lifetime of fulfillment. We are so grateful to the all the Sisters who have turned their dream into a reality. 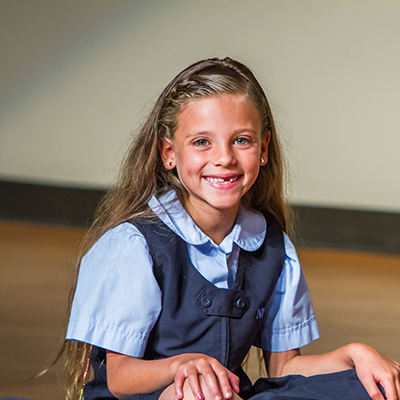 Notre Dame Academy is founded on the commitment of a whole-child education. We are dedicated to helping every child discover their full potential through a blend of traditional and sophisticated learning. 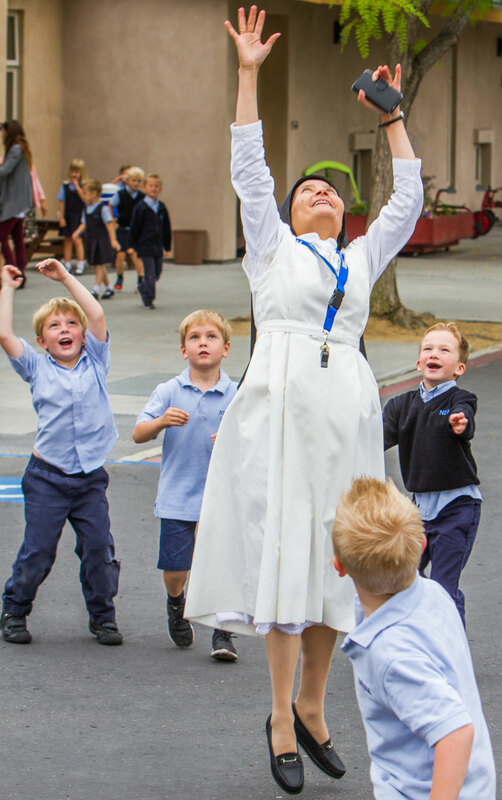 We understand you want a nurturing yet challenging environment that prepares your child for a lifetime of fulfillment and to grow up with a strong foundation in Christian values. 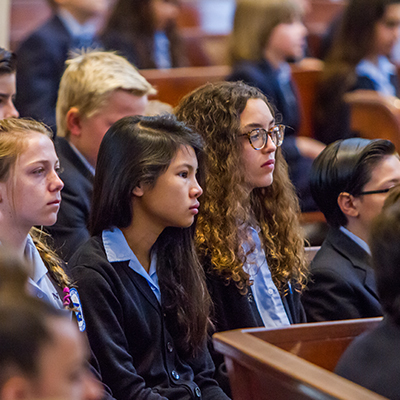 It’s our purpose to foster the faith, confidence, intelligence, and unity that allows our students to be cultivators of opportunity and stewards of our earth and Christ’s love. From our beloved sisters to our thriving arts and sports programs, Notre Dame Academy embraces global citizenship and academic excellence every day. NDA students experience a cultural richness and degree of education completely unique to any school in America. We pledge to nurture every child to their fullest potential; to be an enclave of creativity and culture, rigor and reward, faith and family; to challenge and to inspire; to learn and to laugh; and to lay a lasting foundation for a promising tomorrow. We pray. We are kind. We are hard workers. We are good listeners. We are humble. We are grateful. We are respectful. We are honest. One Family, Run by Sisters, Always Caring. 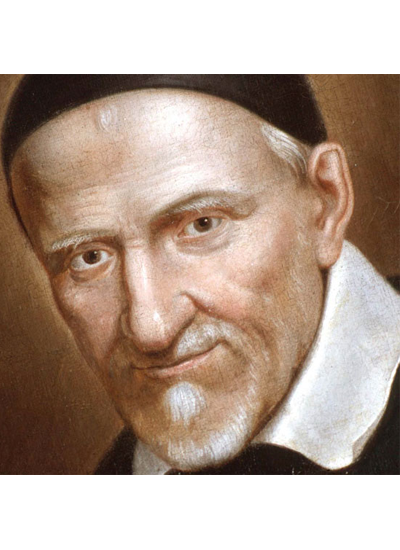 Saint Vincent de Paul was born in the village of Pouy in Gascony, France on April 24, 1581. As the patron saint of charitable societies, he extended his acts of service to all classes of persons, from forsaken childhood to old age. His soul was always intimately united with God, and it was that union that caused him to be so dedicated in his establishment of the Union-Chretienne de Saint Chaumond. Marie Lumagne, born in Paris on November 29, 1599, married a gentleman from the Court of Louis XIII, Francois de Pollalion, in 1617. He passed away in 1625 and it was then that Madame de Pollalion decided to devote her whole life to the service of her Brothers and to put herself at Saint Vincent de Paul’s disposal. 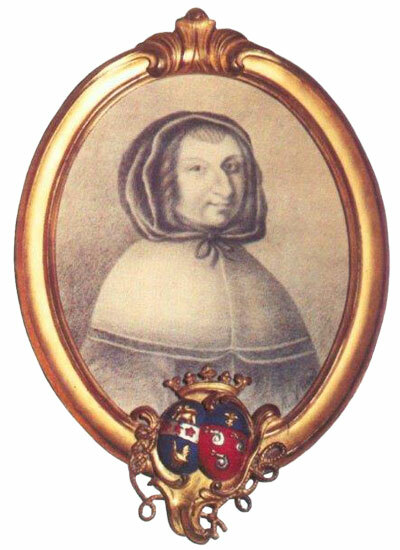 She became one of his main collaborators and accompanied him on his mission around Paris, sharing the tasks of Louise de Marillac, the future founder of the Daughters of Charity. In his company, she visited the charitable societies that he had founded to help the poor, educated young girls, and helped in every possible way. Their partnership and work together is what created the Union-Chretienne de Saint Chaumond, along with everything that it and the Sisters stand for. Challenging Minds To Change The World.